Ready to run?…Oh no, no, no. One very unfit year ago I had the great idea of joining a 5k run, and little did I know how hard it actually would be. Roll on a year and a bigger bum than the year before, and hey presto I’m entering for the 10k. Apparently I’ve lost the plot? Throughout the past few months I’ve been slowly “training” to get my body ready for such intense running. By training I mean attempting to run 5k four times a week and slowly dying one pound of the pavement at a time. However, I aim to make it my absolute mission to reach this goal whether I walk the remaining 5 or not. By the way I’m acting all dedicated and tough, but really I’m a total wimp! The reasoning behind my involvement in the ‘Race for life’ is simply due to the great charity that it is. At one point in our life, or sadly more, we are to be affected by someone we love receiving the dreaded ‘C’ diagnosis. Therefore if running for fitness isn’t enough, this cause is. C’mon Emma! I’d be completely lying to you if I said I wore the most attractive and branded gym gear ever, as I seriously don’t. The comfort I find is throwing my lanky legs into some rolled up ‘M & S’ joggers and a fitted hoodie. Glamour wear? I think not. In fairness this b.e.autiful rolled jogger look is my ‘go to’ as it worked for me and whatever sport I intended to attempt. Many a time I’ve heard friends or family who had purchased new, fluorescent, and fitted gym wear, for it to be settin’ up camp at the back of the cupboard? Although fashion is key, in this case so is comfort. Albeit I don’t look “fit as” when I gym it, but I can’t deny that the sports industry is very present today with its designer, and female geared goods. Such marketing that makes you admire the clothing you’re to gym in. Which undeniably, if I had lots of money, would buy by the dozen. 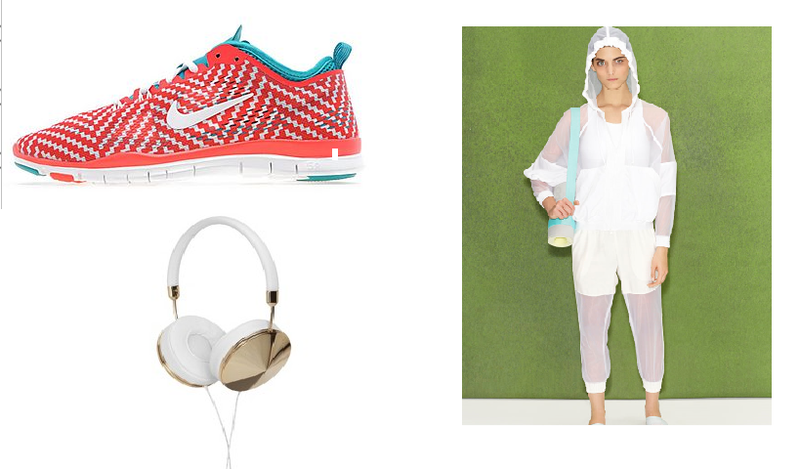 Below is a collection of my favourite Fitness pieces today, and if your any fashion enthusiast, you’ll understand how sportswear these days is not just for fitness. Known as ‘Sport Luxe’, the fashion forward sport wear which can be easily incorporated into the life of the everyday woman. Keep reading in the coming weeks for the update of my journey to the 10k! Manchester 10k, balloons, charity, and Prosecco (I promise I’m not an alcoholic). Outfit: Stella McCartney for Adidas, Jacket- £80.00. Cropped Pant- £85.00. Previous Post Harry and his beautiful bandana. Next Post Aurevoir Manchester… Bonjour Paris.